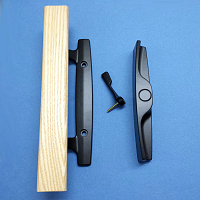 Product was a near perfect replacement for a broken handle on existing door. The only difference was that the hand grip on the new handle was blond and the old unit was dark. Easy to swap the hand grip, however, and all is well now. Excellent service, easy to use web site, and fast response from the company to ship a needed repair part. The handle arrived quickly, your service was great, everything fit and works perfectly. The only problem was that the enclosed screws were too short and we had to supply our own.